We are delighted to announce yet another PG CWWN event! A one day free symposium on “Biomedical Sciences and the Maternal Body” with kind support from The British Society for Literature and Science, on 21st February 2015, at the University of Southampton. When engaging new audiences in contemporary women’s writing, an increasing awareness of the importance of interdisciplinary methods has served to draw attention to the ways in which literary expertise can be used to engage with science and the field of medicine. Women writers in particular exploit the use of literature as a vehicle for promoting social responsibility and awareness, especially when it comes to concerns surrounding recent developments in the fields of science and technology. 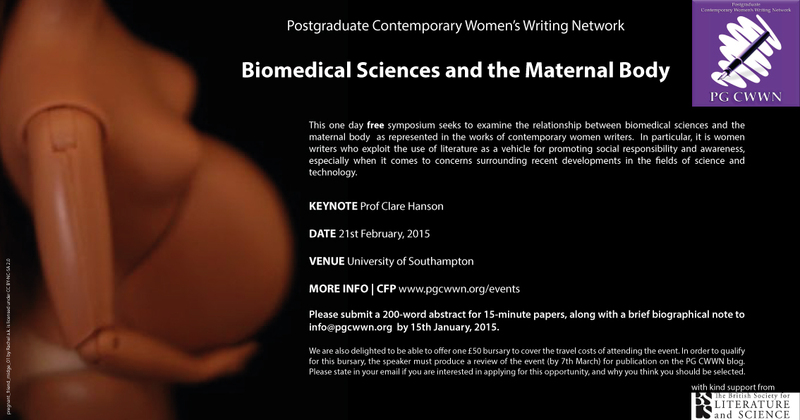 The symposium seeks to examine the relationship between biomedical science and the maternal body as represented in the works of contemporary women writers. The pregnant body has always been a site for much debate, particularly when placed in dialogue with feminist issues of autonomy and subjectivity. When considered alongside biomedical science, these debates are further complicated by women’s ambivalent attitudes towards both the freedoms and the constrictions that modern scientific developments bring. In exploring the relationship between women and nature, biology, science and technology, contemporary women writers go some way towards addressing the questions raised by such discussions. Additionally, we are delighted to confirm Professor Clare Hanson as the keynote speaker for the event. Her research interests lie in the relationship between medicine and culture, with a particular emphasis on theoretical and fictional responses to new reproductive technologies and the cultural implications of modern genetic science. Please submit a 200 word abstract for 15 minute papers, along with a brief biographical note to info@pgcwwn.org by 15th January 2015. We are delighted to be able to offer one £50 bursary to cover the travel costs for attending the event. In order to qualify for this bursary, the speaker must produce a review of the event (by 7th March) for publication on the PG CWWN Blog. Please state in your email if you are interested in applying for this opportunity, and why you think you should be selected. This entry was posted in Uncategorized on 12/11/2014 by pgcwwn.